Ed Lee’s resounding 61%-39% victory in the 2011 mayor’s race makes him the campaign’s biggest winner. Lee dominated the Asian-American vote despite facing multiple prominent Asian-American candidates; he even got the most second place votes from Leland Yee, who targeted Lee for attacks. Lee was also the politician most identified with the “Yes on C, No on D” pension reform measures, which saw the “city family” triumph over the local version of the billionaire boys club. Lee’s imprint was also behind the passage of Prop B, the street repair bond. While Lee tops the winners’ column, the biggest losers include Jeff Adachi, Leland Yee and Dennis Herrera, all of whom fell far short of expectations. Here’s my full list. Lee is the obvious big winner, not simply because he won the election but also because of how he handled himself during his campaign. Despite never having run for public office, Lee displayed calmness under pressure and a sense of humor that veteran politicians would envy. Lee’s opponents tried everything to rattle the interim mayor, starting with his first debate at the Castro Theater. Yet nothing threw Lee off. Many politicians could not have survived the daily media attacks targeted at Lee. Each front-page “scandal” required reading deep into the story before learning that Ed Lee had done nothing wrong. How many people would want to extend this seemingly endless campaign for another month? Thanks to ranked-choice voting, we don’t have to deal with another election until next June. And we save millions of dollars in election costs. The Labor Council made the deal around Prop C possible, and helped it pass. 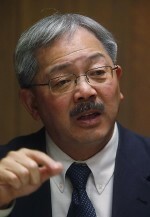 I do not know why polls so underestimated the measure’s support, but its clear that many Asian-American voters supporting Ed Lee followed the mayor’s lead on Prop C.
The apparent victory of Prop B, the street improvement bond, is also attributable not simply to Lee’s support but to the Labor Council backing the measure over the objections of the Building Trades. Some would contend the Labor Council should be in the big loser category, as neither of its top two mayoral choices – Dennis Herrera and Leland Yee – finished in the top two. I saw the initiatives as labor’s top priorities this election cycle, and that appears to be where local unions put most of their funds. San Francisco’s Asian-American electorate was long described as a “sleeping giant.” In election after election through the 1980s and 1990s, local Asian-American voter turnout fell below the non-Asian average. Asian-American voters are no longer limited to impacting a few districts, but have a citywide political influence. Asian-American voters played an important role in Jane Kim’s District 6 race and in the District 10 race won by Malia Cohen in November 2010. Never again will a serious candidate for mayor think they can win without aggressively competing for Asian-American votes. I wrote in 2008 that “with Ace Smith at the controls, nobody will run a better campaign,” and described him in 2009 as “California’s best campaign manager.” Smith ran Lee’s campaign, adding to his string of victories. Smith faced an unusual challenge because the independent Run, Ed, Run campaign meant that some of those closest to Lee could not affiliate with the official Ed Lee for Mayor campaign. Some mistakenly saw Smith as an “outsider” who did not really know San Francisco, when in fact he’s been dealing with city voters on state races (most recently Kamala Harris’ AG campaign) for years. Lee made a smart move in hiring Smith, and Smith delivered. Bill Barnes ran Lee’s day-to-day operations. Barnes is a controversial figure among political insiders for his frequent job changes among politicians of differing ideologies. Operating under very difficult circumstances – how many campaigns are assembled overnight? – Barnes kept the operation going without fuss or fanfare. In case anyone thought he had lost the top skills he demonstrated working for Chris Daly, this campaign said otherwise. Enrique Pearce ran the independent campaign that included many Chinatown activists and some of Lee’s closest supporters. Pearce was despised by other campaigns and hostile news media for his role in getting Lee to run, and they were eager to throw up whatever they could find against him, regardless of the lack of credible sourcing. Pearce gets the last laugh. This week ended an eighteen-month period when Jeff Adachi irrevocably destroyed his progressive base and turned himself into San Francisco’s most unpopular politician. Unlike the character in Ibsen’s Enemy of the People, Adachi angered people not because he was engaged in a public service such as speaking out about a dangerous water supply; rather, he allowed himself to be the front man for those in the 1% seeking to take money from public employees. Fortunately, all of Adachi’s efforts came to naught. Congrats to Nathan Ballard for running strong campaigns against Prop B in 2010 and Prop D in 2011. The onetime frontrunner in the mayor’s race finished an embarrassing fifth. Progressive voters did not buy his reinvention as a progressive, and his former Asian-American base deserted him in droves for Ed Lee. Yee has achieved one of the city’s great crash and burns, and as much as he tried to take down progressive Chinatown groups with him, he failed. The difference between City Attorney Dennis Herrera and mayoral candidate Dennis Herrera is that the former astutely identifies the potential weaknesses in his legal cases while the latter overlooked systemic problems with his campaign. A great City Attorney does not necessarily make a successful mayoral candidate, and now Herrera must deal with the lingering hostility felt toward him by Central Subway advocates, Chinatown nonprofits, the head of DPW, and others who became cannon fodder for his disappointingly negative campaign. I do not expect miracles from the San Francisco Chronicle, but covering a mayor’s race through “gotcha” memos given to reporters by various campaigns is inadequate. The paper started its coverage with two lead stories claiming that Run, Ed, Run was illegal, and ran no official retraction after the Ethics Commission ruled otherwise. That set the tone through Election Day. I mention the Bay Citizen because it is read in the influential Friday and Sunday New York Times. I guess its editors figured that if they used an Asian-American reporter (Gerry Shih) they could freely provide a racist depiction of Chinatown that more closely resembles Charlie Chan movies than actual life. Particularly amusing was Shih’s interviews with Chinatown voters, which showed Lee and his campaign unpopular; it was akin to going into African-American communities in the 2008 election and quoting people who did not support Barack Obama. It seems everyone agrees that the easy availability of public money drew too many candidates into the race, undermined the debate process, and resulted in a less interesting campaign. Two of the fixes seem obvious: funds should be distributed later and no candidate should get more in public funds than they have raised. The current public financing system failed in 2011, and should be amended well before the next mayor’s race.